RSC900-Blue Utilizing quality LEDs and capacitor technology, these devices offer high end architectural and landscape lighting for your home. These solar LED paver lights are easily the industry standard in high end solar accent and indicator lighting. RSC900-Green Utilizing quality LEDs and capacitor technology, these devices offer high end architectural and landscape lighting for your home. These solar LED paver lights are easily the industry standard in high end solar accent and indicator lighting. RSC900-White Utilizing quality LEDs and capacitor technology, these devices offer high end architectural and landscape lighting for your home. These solar LED paver lights are easily the industry standard in high end solar accent and indicator lighting. RSC900-Halogen White Utilizing quality LEDs and capacitor technology, these devices offer high end architectural and landscape lighting for your home. These solar LED paver lights are easily the industry standard in high end solar accent and indicator lighting. RSC900-Red Utilizing quality LEDs and capacitor technology, these devices offer high end architectural and landscape lighting for your home. These solar LED paver lights are easily the industry standard in high end solar accent and indicator lighting. Mini EggLite The Mini EggLites have a pliable cord that allows you to use the lights in a variety of positions or wrap them around your favorite plant or fountain head. Mini EggLite w/Transformer The Mini EggLites have a pliable cord that allows you to use the lights in a variety of positions or wrap them around your favorite plant or fountain head. 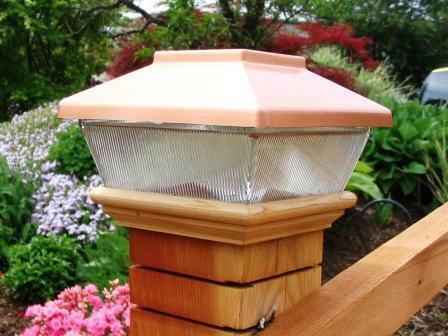 Solar Post Caps-4" These beautiful Copper Top Solar Dual-LED Lighted 4" x 4" post caps add a charming touch to your bridge, porch, fence, or any outdoor area. 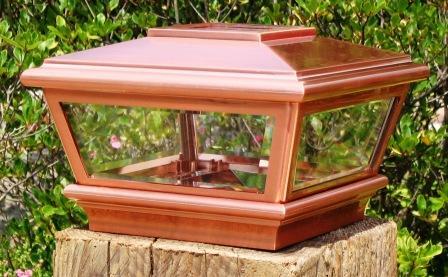 SPCSquareCopper These beautiful Solid Copper Convertible Solar Lights with Dual-LEDs or candle fit 4" x 4" posts as caps & add a charming touch to your bridge, porch, fence, or any outdoor area. Includes 2 Tea-Candles. 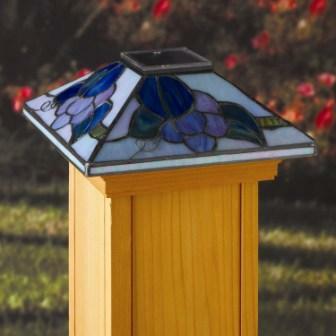 SPCTiffanyGrape These beautiful Solar Tiffany-Style "California Grape" Lights with Dual-LEDs fit 4" x 4" posts as caps & add a charming touch to your bridge, porch, fence, or any outdoor area. 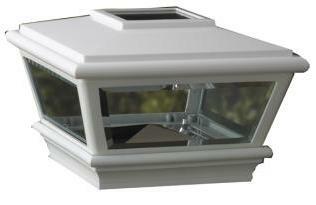 Solar Post Caps-White Add Beauty Day & Night with these white beautiful Solar-Lighted Dual-LED 4.5" x 4.5" post caps. They add a charming touch to your Composite, Vinyl or Wood post, bridge, porch, fence, or any outdoor area. 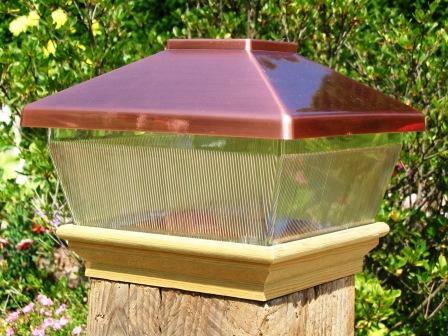 Solar Post Caps-5" These beautiful solar-lighted Dual-LED Copper 5" x 5" post caps add a charming touch to your bridge, porch, fence, or any outdoor area. Great for Composite or Vinyl Posts. (4 3/8" x 4 3/8" Mounting Area) . 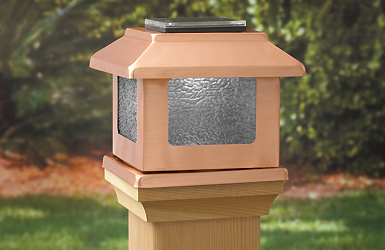 Solar Post Caps-6" These beautiful copper Solar Dual-LED Lighted 6" x 6" post caps add a charming touch to your bridge, porch, fence, or any outdoor area. 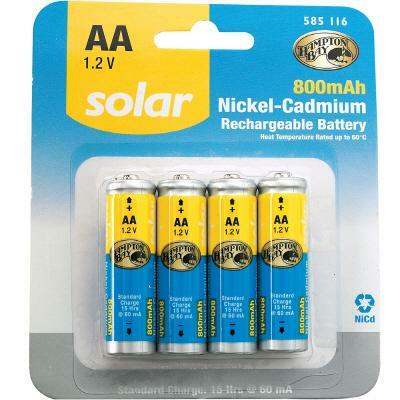 800 mAh Solar AA Replacement 1.2-volt NiCad Rechargable Battery For our Solar LED Post Cap Lights & other Solar Lighting Fixtures. An LED, or Light Emitting Diode, contains a chemical compound that gives off light when an electric current passes through it. They’ve been around for many years, but only recently has the technology advanced so that rather than just an ‘indicator’ light on your stereo amplifier or phone, they can be made bright enough to actually use as an independent light source. LEDs put out a tremendous amount of light for their size and energy draw. They create almost no heat and use very little electricity. White LEDs were only developed in the past few years; before that they were only available in red, green, yellow and a few other colors. Best of all, an LED will last thousands of hours; some have been tested to over 50,000 hours (vs. a standard flashlight bulb that will only last a few hundred hours). On a more technical basis, the centerpiece of a typical LED is a diode that is chip-mounted in a reflector cup and held in place by a mild steel lead frame connected to a pair of electrical wires. The entire arrangement is then encapsulated in epoxy. The diode chip is generally about 0.25 mm square. When current flows across the junction of two different materials, light is produced from within the solid crystal chip. The composition of the materials determines the wavelength and color of light. The shape, or width, of the emitted light beam is determined by a variety of factors: the shape of the reflector cup, the size of the LED chip, the shape of the epoxy lens and the distance between the LED chip and the epoxy lens. headlamps and flashlights). 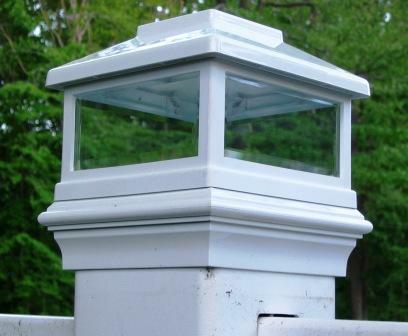 If you look from the side, however, you will find they display much more light than a focused beam, and are thus better for a lantern application where you want light in a wider area.